On the coast of southwest Africa, two oceans meet – the waters of the Atlantic Ocean and the sands of the Namib, one of the oldest deserts in the world. Under the burning sun, temperatures climb to 45C, sometimes 60C; during winter nights, they drop to -5C. Hard to believe anything can survive in such extremes. But, as always, some creatures do. Like the Namib Desert beetle … it does a spot of ‘fog-basking’ to trap water. Facing the fog-laden wind, it adopts a head-down stance on the dune crests, waiting for water from the fog to condense on its hardened wings. This eventually trickles into its mouth. Clever. Other creatures that live here include the short-eared elephant shrew, the oryx, the mountain zebra … Some succulent plants also manage to survive, including the shrub-like ‘Welwitschia’, which has only 2 leaves and can live for over 1000 years! Who counts these things, that's what I want to know. There is also a special group of desert-dwelling elephants here, traversing the harsh terrain between the Skeleton Coast and the Kabere Mountains of the interior. They’re special because, over 20 years ago, poachers killed almost 80 of these elephants, leaving only 3. With large-scale poaching at an end, the herd has a chance to recover, but they’re still very secretive. What I didn’t know, and only recently discovered, is that horses live here too! They have managed to survive in the heat for over 100 years, in almost complete isolation, and are referred to as a separate breed, the Namib Desert horse. These horses are so well-adapted to the desert that, despite the heat and absence of grass, they can go without water for several days. 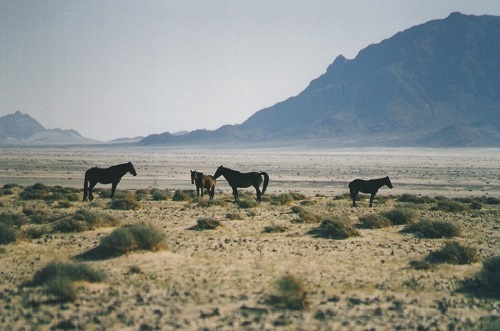 Originally there were no wild horses in the Namib; these herds were introduced by humans. In 1907, Hansheinrich von Wolf, an officer in Kaiser Wilhelm II’s army, acquired the Duwisib farm. He had stallions and brood mares sent from South Africa, which he crossbred with English, Arabian and German horses. Later he imported Hanover, Trakehner and Hackney horses from Germany and England. In 1908, while building a railroad between Namibia and South Africa, the Germans discovered diamonds around Kolmanskop, and the area was declared off-limits. A watering place was dug, named Garub, for the cavalry and for the steam trains. In 1913, the South African army invaded the country, and the German soldiers fled, leaving a large number of horses behind. The herd stayed close to the watering holes they knew, maintained by a ranger in charge of this land. Over the years, enough water was always left to provide an adequate supply for the horses. In 1986, the mining company turned 350km 2 of the restricted area over to nature conservancy, which saved the habitat and future of the Namib Desert horse. The area around Garub was then incorporated into the Namib-Naukluft Park, the largest game park in Africa. The herd numbers are usually kept at around 150; according to the Namibian experts, any more would upset the desert’s fragile ecosystem.